The 16x9 Inc. Cine Base M15 Support Base is a part of the camera support setup used to balance the camera when shooting with zoom lenses and other accessories. The dual lock knobs lock the 15 mm support rods onto the Cine Base; they can also be used to adjust the rods individually for fine tuning. 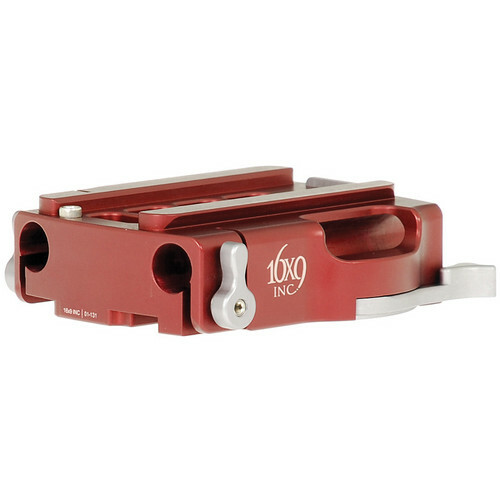 A locking lever with a spring-loaded brake system securely locks the Cine Base onto the compact Dovetail or any industry-standard dovetail rails. On mounting the camera support plate to the Cine Base, a safety lock automatically falls in place and secures the plate to the base. The presence of delrin, a thermoplastic with low friction, on the bottom of the Cine Base allows it to smoothly slide over the dovetail. The Cine Base is made of solid aluminum, which makes it highly durable. The Cine Base is designed to mount onto studio base plates from ARRI or Chrosziel. Box Dimensions (LxWxH) 7.15 x 5.25 x 1.65"